The Blackhawks close out their 2013-14 series against Carolina on Friday with their second and final matchups this season. In their first contest on Oct. 15, Patrick Sharp—following the birth of his second daughter just two days earlier—tallied a regulation goal and another one in the shootout winner to help the Blackhawks win 3-2 in Raleigh, 3-2, while Corey Crawford made 34 saves. Marian Hossa leads the Blackhawks with 55 points (24G, 31A) in 50 career games against Carolina. While the Blackhawks’ record in March has been so-so, two of the team’s forwards have been doing everything they can on the scoreboard: Andrew Shaw and Patrick Sharp. Between Jan. 23 and Feb. 28, Shaw netted just one assist for the Blackhawks over a span of nine games. Since then, however, “The Mutt” has been much more productive, recording seven points (4G, 3A) in his past nine games, including points in six of his last seven appearances. Meanwhile, Sharp enters Friday’s game having recorded a point in eight of his last nine games (1G, 9A), including his 15th multi-point game of the season on Wednesday against St. Louis. Sharp’s 68 points are good for ninth overall in the league, and second on the team behind Patrick Kane’s 69. In the wake of recent injuries to Marian Hossa, Brandon Saad and Patrick Kane, one of the players to step up and fill in as needed has been Ben Smith. While the 25-year-old Connecticut native was used to getting fourth-line minutes—averaging 12:16 of ice time per game this year—he has responded well to a bump up in the lineup, and the increased playing time that comes with it. Smith has recorded three points in his last three games (2G, 1A), which included his first career power-play goal on Wednesday against St. Louis. He skated 18:15 in that game after logging a career-high 18:42 in Tuesday’s OT loss at Philadelphia; Smith had only recorded 18-plus minutes of ice time once before in his NHL career, in 2012-13’s regular-season finale, when many Blackhawks regulars were rested ahead of the team’s playoff run. One of the major reasons for Carolina’s disappointing season has been their lack of offense; their 2.48 goals-per-game average ranks in the league’s bottom third, and their 12.7 power-play percentage is second-worst in the NHL. The team has just one 20-goal scorer so far in Jeff Skinner, while normally productive forwards such as Eric Staal, Alex Semin and Jordan Staal—all of whom have averaged more than 20 goals per year in their NHL careers—have been hampered due to injury and inconsistency. With former Stanley Cup-winning goaltender Cam Ward in and out of the lineup this year due to injury, backup Anton Khudobin has filled in admirably for the Canes, leading some media around the team to speculate if this is Ward’s last season in Raleigh. Khudobin paces Carolina in starts (26) and wins (15), while his 2.25 goals-against average and .928 save percentage both rank among the league’s top 10. The Kazakhstan native is coming off a 3-1 win against Columbus on Tuesday in which he made a career-high 46 saves, even after his team was outshot 19-0 in the third period. Though Carolina’s offense hasn’t been there this season, many of their other stats, especially on defense, suggest that this is a team that could surprise any opponent. 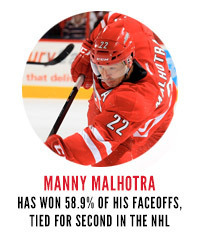 The Canes own a .765 winning percentage when leading after one period, a testament to how well the team defense, led by 2014 Olympians Justin Faulk and Andrej Sekera, and Khudobin have performed. Carolina also ranks fourth overall in faceoff percentage, one spot over Chicago, winning 52.1 percent of their draws this year. Without top playmaker Patrick Kane, the Blackhawks may have to go back to basics to get two points: making short passes, going to the net and playing a responsible defensive game.